We have just experienced “Snowpocolypse 2016.” It snowed from noon to 10 p.m., depositing an amazing 8 inches of the white stuff at our front door. Our neighbors 80+ miles to the west in “P-Town” (read: Portland), found their metro area “shut down” for hours as they struggled with 2 inches of slick ice and snow. Is this common? Historically speaking, no. 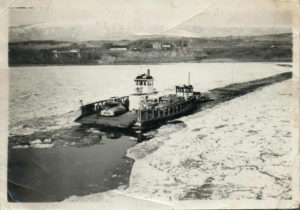 What WAS “common” was to have the river freeze over and shut down river traffic completely for months. 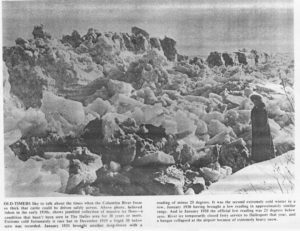 We have a memory of our own grandfather who recalled taking a horse across the Columbia River on ice, sans bridge or ferry. In perusing history, we found a reference to the 1862 coldest temperature recorded in The Dalles, of -24 degrees. The little chill from the current +22 degrees today is a trifling in comparison. Ben Snipes, the Pacific Northwest Cattle King, lost 90% of his herd during the winter of 1861. Estimates of his cattle holdings in the fall of that year were between 25,000 to 40,000 head of cattle. 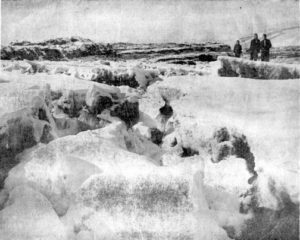 But in 1861, better than a foot of snow fell during the early part of that winter, to be followed by rain, which in turn was succeeded by intense cold, to be followed by a second two feet of snow followed by rain drizzles. By the closing days of December there was an ice-cap of this character about three feet in depth. By the time Chinook winds came in February, about 10 percent of the cattle remained alive. Gullies were deep with decaying carcasses, where the cattle, seeking each other’s warmth and companionship in their suffering, died together when the Chinook failed to come soon enough.